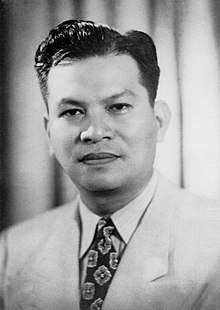 Ramon Magsaysay (31 Augustus 1907 - 17 Maart 1957) was 'n Filippynse politikus en onafhanklikheidsaktivis. 7th president van die Filippyne 30 Desember 1953 tot 17 Maart 1957, Sekretaris van Nasionale Verdediging 1 September 1950 – 28 Februarie 1953, 1 Januarie 1954 – 14 Mei 1954. The First Team, a 1971 thriller by author John Ball, hinges on the effort to recapture the USS Ramon Magsaysay, an American ballistic missile submarine. Freeing the submarine from control of the Soviet Union will force the Soviets to surrender their occupation of the United States. In Robert A. Heinlein's novel Starship Troopers, the smallest starships are named after footsoldiers. Upon reading some of their names, Filipino protagonist Johnnie Rico remarks "There ought to be one named Magsaysay." In Gundam Seed, an Agamemnon class carrier is named after Magsaysay; in episode 48: "The Magsaysay will take command of space divisions 48 and 211 from this point on", and this reference is further related to Starship Troopers' tribute: "The remaining vessels of the 15th carrier group are to gather at the signal coordinates of the Heinlein"
Wikimedia Commons het meer media in die kategorie Ramon Magsaysay. Die volledige teks van Ramon Magsaysay kan by die Afrikaanse Wikisource besigtig word, by en:Ramon Magsaysay.